Randy and Debbie were playing in the front yard. Suddenly they heard shouting. They ran to the gate. Harry Brown was racing down the street, a crowd of children behind him. The children were booing and yelling: "Harry is a meany, a meany, a meany! Harry is a meany, boo! boo! boo!" "Oh, look!" Debbie cried. "They are chasing Harry Brown." "Serves him right," said Randy. "Harry IS mean." "I know," Debbie agreed. "But I feel sorry for him—a little bit." "I don't," Randy said. "Yesterday Harry knocked me down and I skinned my knee. He is always chasing someone and hurting them. Come on, let's yell too." Debbie shook her head. "No. Let's not." Randy shrugged. "Okay," he said. 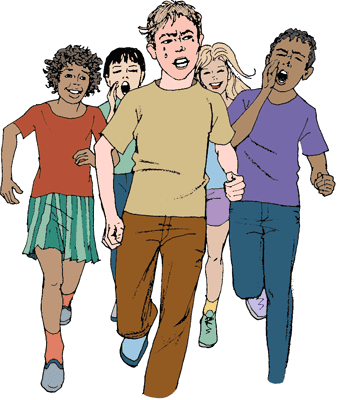 They watched silently as Harry and the noisy crowd of children rushed past. Harry's face was red and he wore an angry scowl. There were tears on his cheeks. Randy and Debbie turned and ran into the kitchen. They told Mother about Harry. "I am glad you did not yell at him or chase him," Mother said. "Harry is new on our street. He needs a friend." "But, Mother," Randy protested. "Nobody could be Harry's friend. Last week he knocked his own brother down and hurt him. He hits us when we haven't done anything to him. He wants to be our enemy, not our friend." "He may act like an enemy," Mother said. 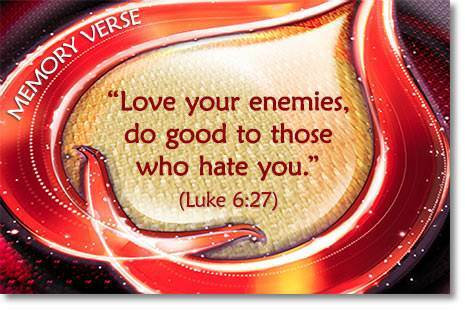 "But when he does, remember that the Lord Jesus had told us how we are to treat our enemies. It is found in Luke 6:27 and 28. Get your Bibles and read it to me." 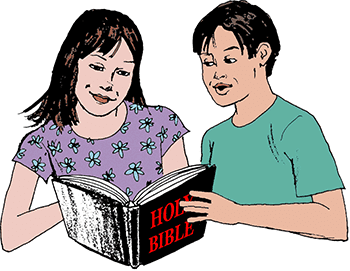 The children read together: "…Love your enemies, do good to those who hate you, bless those who curse you, and pray for those who despitefully use you." "What is despitefully?" asked Debbie. "That is when someone insults you or is mean and unkind to you," Mother explained. Randy was reading the verse again. "If people hate us, I don't see how we can love them and do good to them," he said. 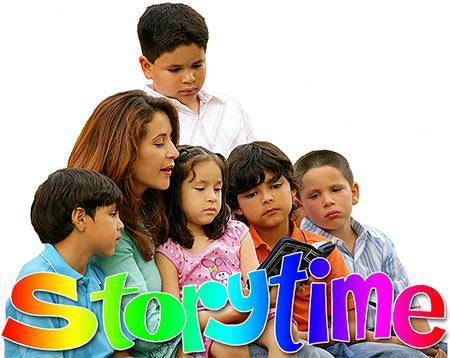 "Children, do you remember the story of Joseph? He was just a young boy when his brothers began to hate him and treat him badly." "I remember," Debbie said. "His brothers took away his beautiful coat and threw him into a pit." "Then they took him out and sold him as a slave," Randy added. "And it was years and years before Joseph saw his father and brothers again." "Yes," said Mother. "And when he saw his brothers again he did not try to pay them back for their meanness. Instead, he forgave them. He gave them food and cared for them during all the years of famine. But there is Someone else who had many bitter enemies. They were mean and unkind to Him but He kept on loving them and helping them. He even died for them." "It was Jesus, wasn't it?" said Debbie. 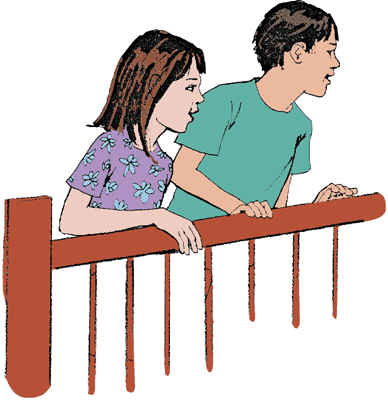 Randy and Debbie looked at each other. "We will try," they promised. And all during the next week they prayed for Harry every night. They tried to be kind to him every day. 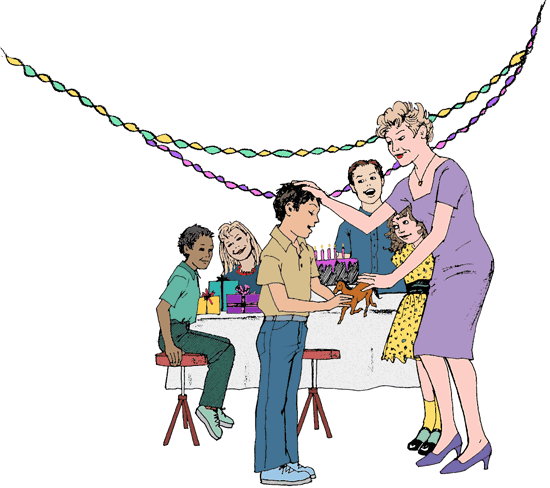 On Saturday, Peter came to invite the children to his birthday party. "Oh, goody," cried Debbie. "I love parties." "Are all the kids on our street going?" Randy asked. Peter nodded. "Sure, everyone but Harry. He is too mean." "Oooh," said Debbie. "Jesus said we were to love mean people and be good to them." Randy ran and got his Bible. He showed the verses to Peter. "Well," Peter said slowly. "I guess Harry can come. Mother told me to ask him but I didn't want to." "I'll go with you," Randy offered. When the boys asked Harry to come to the party, he stared in surprise. "Aw, you don't want me to," he muttered. "Yes, we do," Randy said. "We want to be friends." "Huh," Harry said. "The kids will yell names at me." "They won't if you don't hit them," Peter told him. "Okay, guess I'll come," Harry said. That afternoon, all the children on the street came to the party. They played games and ran races. In one race Randy and Harry were close to each other. Harry wanted to get ahead so he gave Randy a push. Randy stumbled but he did not fall. He ran faster than before and he won. "Here is your prize, Randy," said Peter's mother. She gave Randy a little brown plastic pony with prancing feet. "Wow!" Harry said, eyeing the pony. "Isn't he a beauty? Wish I had one like that." Randy held the tiny pony in his hands for a long minute. He thought about Jesus being kind to His enemies. 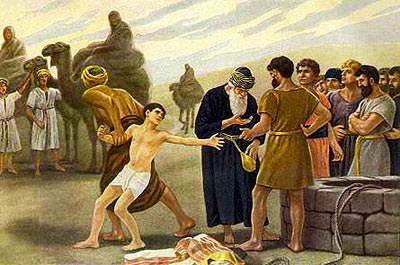 He remembered how good Joseph was to his mean brothers. 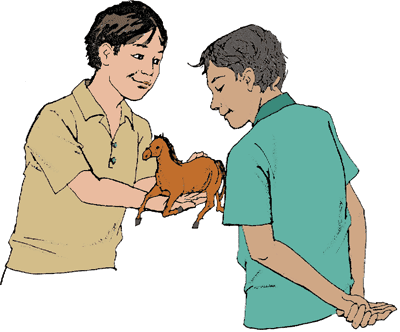 Then he held out the pony to Harry. "You may have it, Harry," he said. "Honest?" Harry's face broke into a big smile. "Wow! Thanks, Randy." Then he added, "I'm sorry I pushed you. I won't do it any more." When Randy and Debbie got home, they told Mother all about the party. "How did Harry get along?" Mother asked. "He was nice until he pushed Randy in a race," Debbie said. "But Randy won anyway. And do you know what Randy did, Mom? He gave his prize to Harry. It was a beautiful little pony." Mother gave Randy a special smile. "Good for you, Randy," she said. Randy was happy. "I'm glad I learned how to treat our enemies," he said. "I think Harry will be friends now. 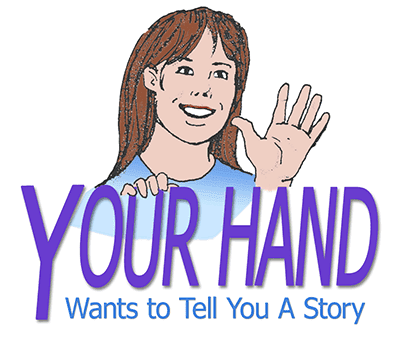 Maybe he will come to Sunday School and learn about Jesus too." "I'm sure he will," Mother said. "We will keep on praying for him." The three fingers in this drawing remind us of three crosses that stood on a hill outside Jerusalem. The Lord Jesus hung on the middle cross. The middle finger reminds me that Jesus died for me. Two thieves hung on the outside crosses. One of these men died in his sins. He was lost. The other man trusted Jesus as His Savior. He was saved because he received Jesus as his Savior. When you receive the Lord Jesus as your Savior, you are saved too. You can say, "I receive Him." Point to your fourth finger and say it: I RECEIVE HIM. Receiving the Lord Jesus as your Savior is the most wonderful thing you will ever do in your whole life! If you have never taken the Lord Jesus as your Savior, you can do it now. 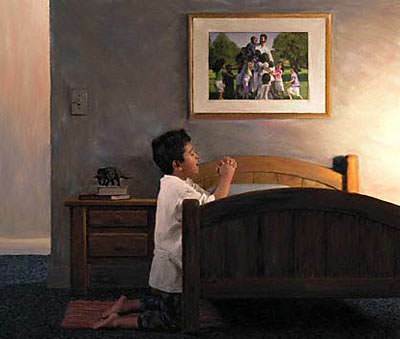 Just pray to the Lord Jesus and say, "Lord Jesus, I know that I have sinned, and I am truly sorry for my sins. 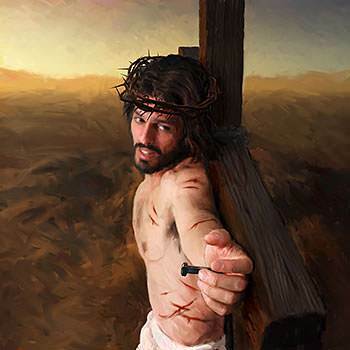 I thank You for loving me so much and for dying for me. Please come into my heart right now to be my Savior." 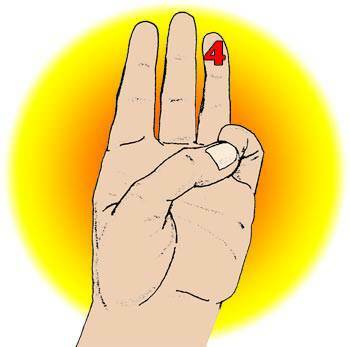 Now let us point to finger 4 and say: "Number 4, I RECEIVE HIM." Finger number 5 is your little finger, but it has a BIG story to tell. It is in your next lesson.